UPDATE: You can now get these games and more in a variety of colors and themes in my Etsy shop! See end of page for free printables. 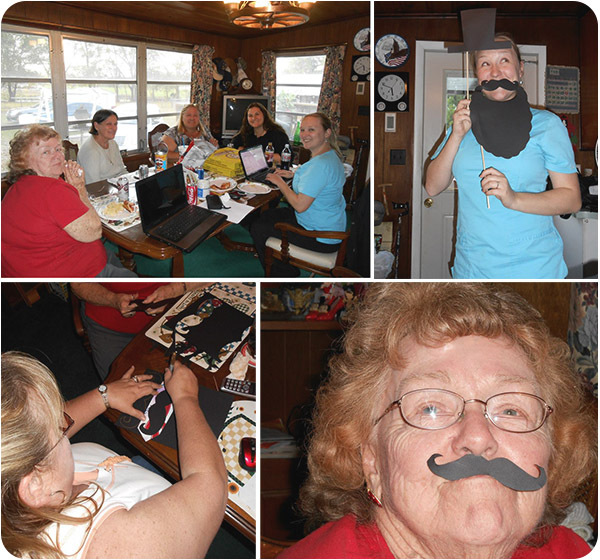 Our menu was light and fun, including a chocolate fountain, peanut butter and banana sandwiches, Aunt Eva’s famous party punch, and a sweet “little man” cake and mustache cupcakes. Thanks to Renee’s napkin rolling abilities, we even had bow tie napkin and utensil sets! Guests were greeted at our activities table where they could get in on the games, from guessing the number of kisses in the jar to “Words for the Wee Hours” (For details and rules on all the games and activities as well as free printables, jump to below the pictures). For my gift for little Logan, I had Kyle ship some of his old tee shirts to me. I found a tutorial and patterns for upcycled shortalls over at Feather’s Flights. This was my first attempt at chothesmaking, but they turned out super cute thanks to her awesome tutorial! 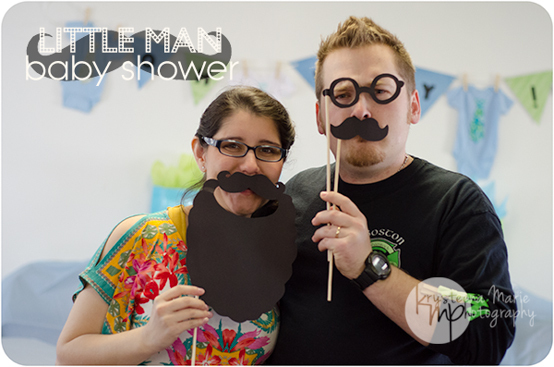 So our Little Man baby shower was a smashing success, and although we hated to let Kyle and Beth head back to California, we were happy they enjoyed the party! Looking for these games in a different color, size, or other customization? Stop by my Etsy shop! 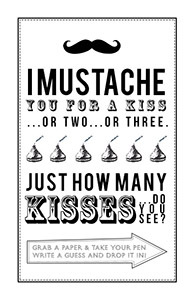 Mustache You for a Kiss: Guess the number of kisses in the jar. The guest who guesses the closest without going over wins the jar of kisses. I found “it’s a boy” kisses at Michaels. The Clothespin Game: Each guest gets a clothespin as they arrive. 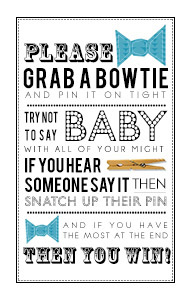 If you hear anyone say “baby” you can take their pin. The person at the end with the most pins wins. I cut bow ties out of fleece and hot glued them to the pins because I had some scraps lying around, but you could use felt or any material you’ve got lying around the house. 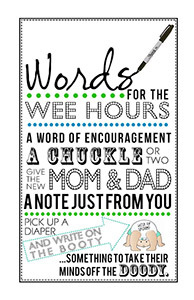 Words for the Wee Hours: Provide diapers and sharpies for guests to write words of wisdom or little chuckles for mom and dad to read when they change the little one’s diapers in the “wee hours” of the morning. Baby Name Scramble: Write the baby’s name at the top of the paper (or have it posted so people can see spelling) and give guests 60 seconds to come up with as many words as possible using the letters in the name. If mom and dad haven’t decided on a name for the baby yet, you can use baby related words or other words that go along with your theme. Rattle Relay: For this one, you split the room into two even teams (and be sure not to tell them what they’re signing up for!). The teams line up facing each other and the person at the start of each line is handed a rattle tied to a very long string. Once the music starts, each team has to get the rattle from the start of the line to the end… by weaving it through their clothes. In other words, the first person drops the rattle down their shirt and pants, and the next person has to take the rattle up from the bottom, next person down the shirt and so on (Since leggings are now quite popular, we ended up just having everyone weave through shirts so it wouldn’t get stuck). Once the rattle gets to the end and the team thinks they’ve won, let everyone know it’s not over until the rattle makes it all the way back! you guys are the absolute cutest 🙂 these are genius ideas! I am a subscriber to your blog and a fellow blogger. I wanted to congratulate you for what I think is an outstanding post. Your essay reflects so much – your passion for your family (congrats on your pending aunthood), your resourcefulness in planning the event (ever consider adding party planning to your arsenal? ), and your ability to capture the energy and emotion through your photography. What a pleasant start to my morning. Congratulations again – on many levels! Scott, if she would listen to her mom(me) she would definately add party planning to her arsenal. Call me prejudice, but this girl is a genius and she is so amazing with all of her talents! Great job as always girl! Love the presentation!!! Super ideas!! Thanks for sharing your signs. I can’t wait to use them for the baby shower I am having tomorrow. I’ll have to see if I can get my hands on the recipe and I’ll be sure to share it! I finally got the punch recipe from Aunt Eva! Here it is for anyone who would like to give it a try! Mix together in a 1 gallon jug preferably an empty water or milk jug. Two packs of Kool-Aid small packs what ever color you want your punch to be. One large can pineapple juice and 2 cups of sugar. Shake all contents really well then add water to finish filling the Jug but leave room for it to expand in the freezer, probably 1 to 2 inches from the top. Put in freezer. Before serving pull out of freezer to partially thaw, but still slushy. I usually cut Jug in half or a larger hole in jug to get it out when it comes time to serve it. When serving add Half a bottle of gingerale per 1 gallon jug of frozen punch. It will be slushyhttps://krysteenamariephotoblog.wordpress.com/wp-admin/edit-comments.php#comments-form! Awesome! Best of luck with your shower and congrats to your sister! 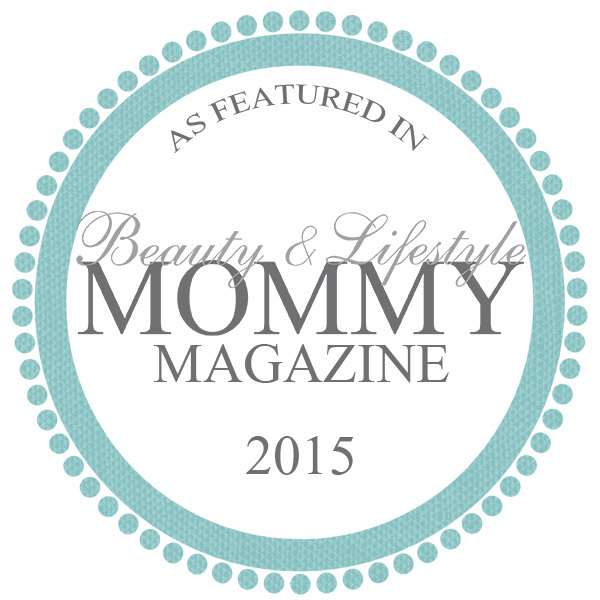 Wanted to thank you for actually having printables…and being free. 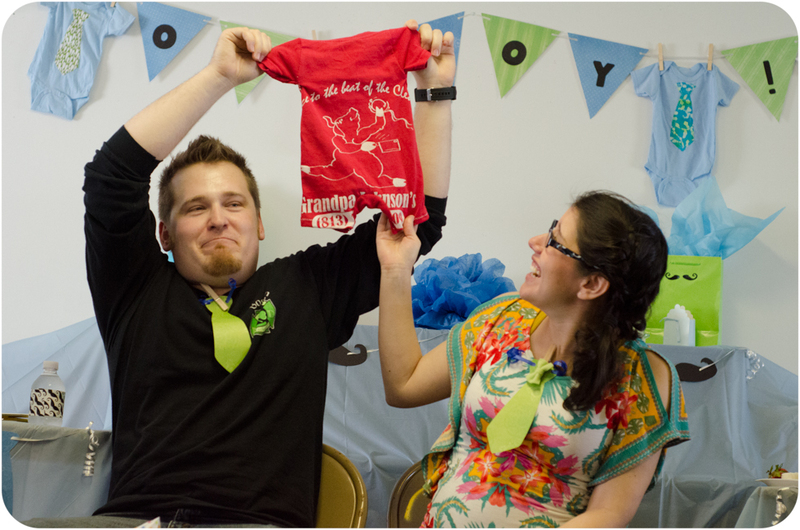 I have been searching the internet for hours to find something that was for boy baby showers. Thanks to you, I have finally found what I needed and can relax until the baby shower this afternoon. THANK YOU! With the free printables do they print out Like 8×10? Games in my Etsy shop are available in 8×10 and 5×7.